A good trolling motor needs to be backed up by a great trolling motor battery because when you take a look at it, a motor is no use without a battery. Although there are many general purpose batteries you can find, these aren’t ideal to take out on the water in many cases. The rigors and the use they are put through can kill them before you have had a chance to fully enjoy your boating experience. Here, we’ll take a look at the best electric boat motor which will fill all your needs while offering a long life. If you think a battery is a battery, and they are all the same, you are very much mistaken. Regular vehicle batteries are constructed in a way to give that initial boost to start the engine and provide power for short periods. These have what is called a short cycle. A boat battery or marine battery is a deep cycle and constructed to provide power for longer durations, they aren’t there to start an engine or motor because they are the power source for these motors. 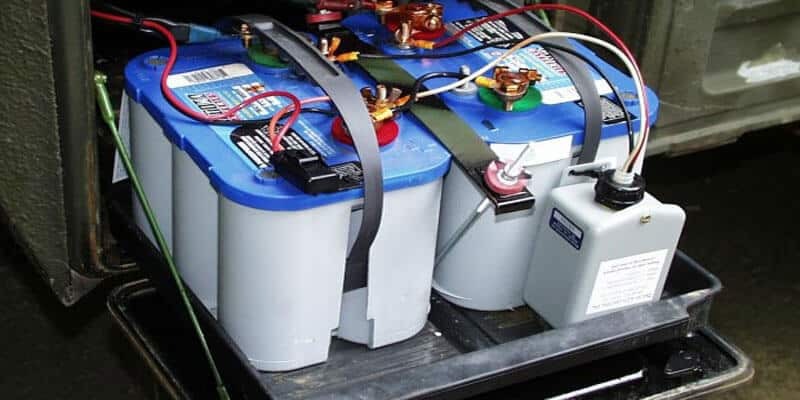 There are various types of marine deep cycle batteries, and choosing the correct one for your boar depends on the use of your trolling motor. Is it used as secondary propulsion for positioning or do you have a smaller boat, and it is your primary type of propulsion? Wet Cell Batteries – most affordable, uses liquid acid, designed for frequent charging and discharging. AGM – Absorbed Glass Mat batteries are built using fiberglass matting, completely sealed, faster charge and last longer than wet cell. Lithium-Ion Batteries – Much lighter than AGM batteries but much more expensive, provide high performance, fast charging and last a long time. As you can see, the choice of deep cycle marine battery isn’t easy, and for this reason, we have compiled a list of the top contenders. Browsing the list below might make it much easier when you are struggling to think what battery do I need? To make things even harder, there are specific things you need to take into consideration when purchasing a battery for your trolling motor, these will be highlighted after the reviews. The Optima D34m is rated at 750 cold cranking amps. 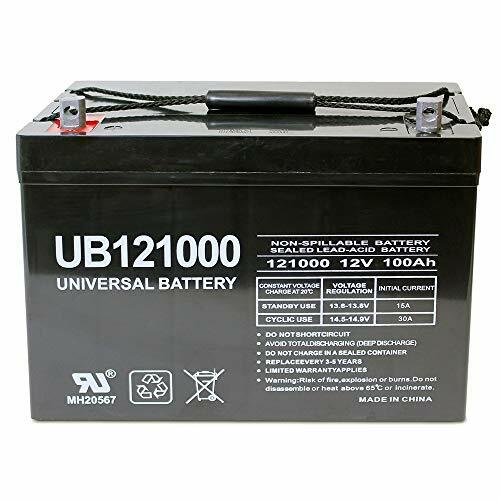 This is an excellent battery for boats, and can also be used for an RV or for mechanical equipment as a starter power source. Designed to be used in colder weather and rougher situations. Can withstand 15 X more vibration than similar batteries. Optima battery warranty is 2-Years – free replacement if it defects. The charge can remain for up to a year when not in use. Just clean the battery terminals, and you’re ready to go. 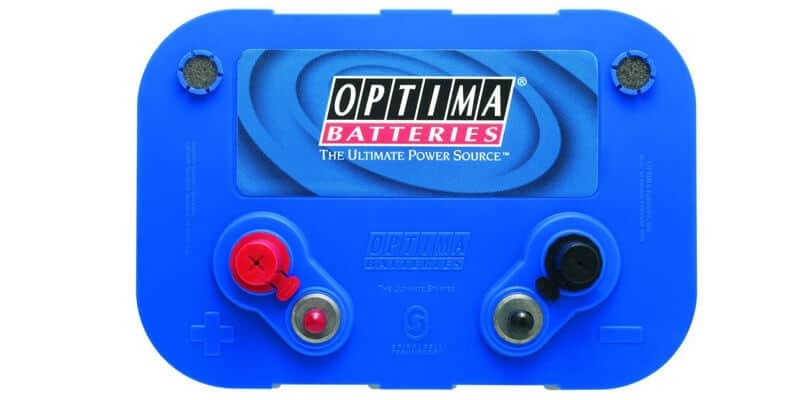 This Optima battery review ran this multi-purpose battery through its paces. As with all Optima batteries, we found it was better to use their own Optima battery charger over the use of off the regular shelf chargers. These maintain the battery in the best of health and come with safety features to make sure the battery doesn’t overcharge while offering faster re-charge times. 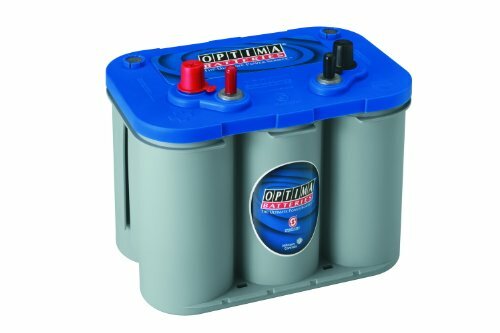 With the marine batteries of this spec being priced in the mid-$200 range, many users ask, are optima batteries worth it? When you take into consideration the durability, the ease of maintenance and the chance to position this lightweight battery in any position with no fear of leaks. Then yes, Optima marine batteries in this family are worth it and will be for many years of heavy use. All this leads it toward being the best marina battery for the money. Power delivery good for up to 2 hours. Leak-proof Interstate AGM battery construction – thermal welded. 45-day money-back guarantee with a 1-year replacement warranty. Only suitable as a secondary power source on a small boat with a small trolling motor. Interstate battery hours only suitable for small motors and light use. This Interstate battery review took a look at the small 12v battery on test. They come in under $100 which can be more affordable, but with this, you do get the performance you pay for. The interstate deep cycle battery can be mounted almost anywhere due to its small form factor, and the leak-proof design. Because it could be prone to overcharging, it would need a battery charger which is capable of shutting off once a full charge has been reached. The interstate marine battery can reach full charge quickly due to its smaller size. The smaller size and cost of the Interstate marine deep cycle battery can lead boaters to snap them up or pass them by because they ask themselves are Interstate batteries good value for money? All this depends, it depends on the size of your boat, the size of your trolling motor, is it your primary power source, or is it a secondary power source? All these factors should be considered. If the deep cycle marine battery Interstate makes fits your needs, it can be a great battery, but don’t expect your world to be lit up. Gives around 2 hours on the water with half power remaining when used on smaller motors of the 12v deep cycle marine battery. Easy to install anywhere with its spill-proof design. Light in weight, so ideal for small kayaks. No special charger needed for this. Being an honest Mighty Max battery review, we looked at all the plus points and the downsides. The battery is small and thus underpowered for larger motors or boats, and extended use. It does give a couple of hours while the motor (no more than 30lb thrust) is being used on the medium speed, or for intermittent trolling once in position. The battery is also too small to be used in conjunction with the Minn Kota trolling motor power center if your boat doesn’t have the necessary compartment. When searching Mighty Max batteries reviews, this has been one of the largest gripes. Also, there is a mixed bag on the power consumption. Some users are claiming great power while others state they aren’t even reaching the 2-hour mark. All in all, it’s a decent battery when you are only making half day trips or using as a backup battery. With all this in mind, it could be worth the less than $100 price tag considering you still get a 30-day refund and a 1-year manufacturer’s warranty. Multiple charging methods – charger, vehicle alternator, solar panel or wind turbine. Suitable for boats with motors over 40-100lb of thrust. 12-month warranty and 30-day money back guarantee. 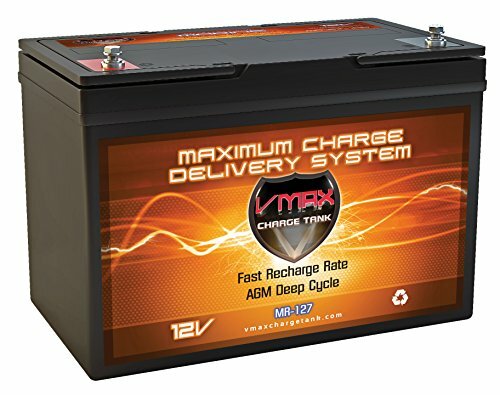 The VMAX MR127 is a first-class battery from VMAXTANKS which provides plenty of power for many uses aside from powering a trolling motor. It is designed as a Group 27 type battery and is built for heavy knocks and vibrations, and with the use of a power kit, it can be protected even further. One of the most prominent downsides of this VMAX deep cycle battery is the cost, it weighs in a little under $300, so it is suited more to serious users who are in possession of a larger boat, or a high thrust motor. All through testing, it showed its strengths more than the downside. For small boat owners, it’s not really a wise choice because the 12-volt marine battery eats up a lot of space. This being said, for serious use, the VMAX battery is probably the best in for overall usability, bit size and cost severely restrict how practical it is for most users. This battery is built to withstand any rigorous use you can throw at it. Although it’s lifespan isn’t as long as some, in this time, it can be used for many different applications aside from powering high thrust trolling motors. With a 12v converter, there is more than enough juice in it to power electrical items in an RV. 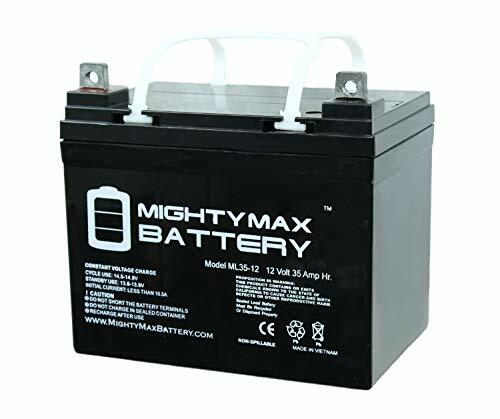 For users have medium to large trolling motors, it would be easy to see the large gap in comparison with this battery and a 12 volt 35 amp hour universal battery. When not being used, it loses a minor part of its charge, so you can charge it and still grab it to haul it on your both within a couple of months with no power drain. This deep cell battery is highly rugged and can be mounted in any position, it won’t leak, and there is no maintenance required. It is the largest one we tested on our battery group size chart. When it comes to charging this behemoth of a battery, it is surprisingly quick for the size and power. At only 10 amps, from a battery with no charge to a full charge takes only 12 hours. This means you can charge overnight and you can get as long a usage when you take it out on your boat. 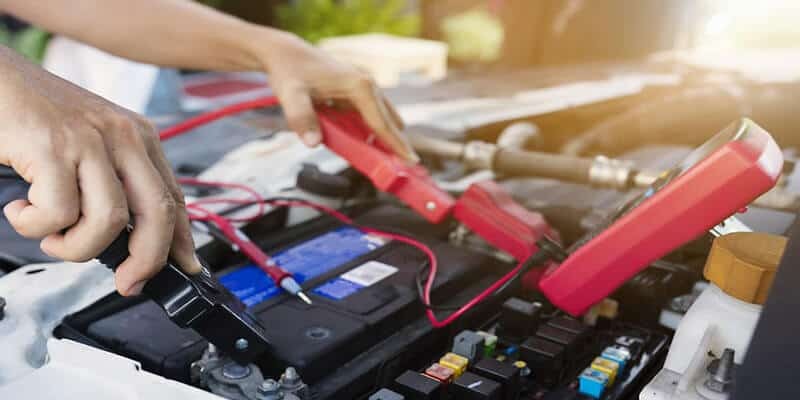 Aside from the type of battery, and is either a wet cell, AMG or Lithium-Ion, there are other things you need to pay attention to because these could affect battery life as well as your motor performance and boating experience. This is often abbreviated to amp or Ah, and this is crucial to determine what size battery you need for your motor. This is basically, the power your motor needs to run it at the correct speed. In most cases, these batteries come in a 12v form. However, there are on occasions some trolling motors which come in a 24v form. To do this for these larger motors, it would require two 12v batteries connected together, this is same if you have a higher voltage motor, so a 36v would need 3 batteries, and a 48v needing 4 respectively. In general terms, the larger the ampere-hour rating, the longer your motor will run for before the battery loses its charge. 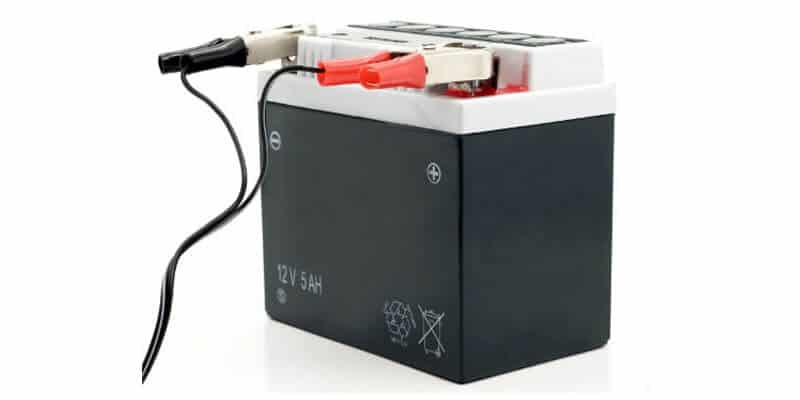 When you compare dual purpose batteries to deep cycle batteries, it can be hard to calculate the length of time each type will power a trolling motor for, but you will generally find smaller batteries measure between 25Ah to 50 Ah while the much larger deep cycle batteries can reach 100 Ah. Although you need a trolling motor battery of a certain size depending on your motor specs, there is no upper limit, but generally, it means the larger the battery, the longer you can spend on the water. There are other areas which fall under this, and many are into your wiring loop and your boat. There is much more to fitting a motor than just fixing a trolling motor mount and connecting a battery. 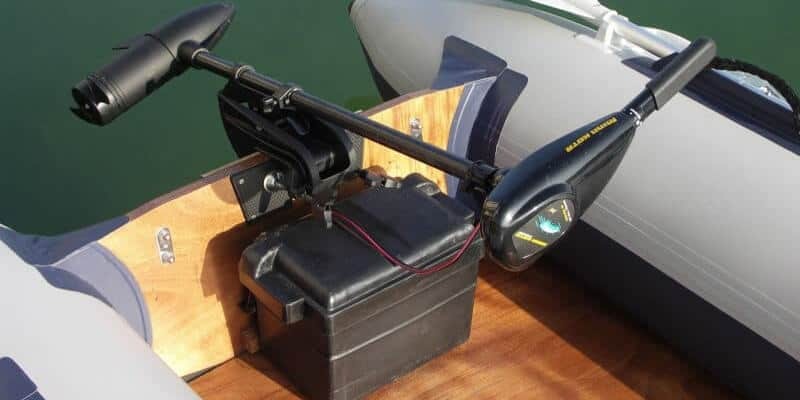 Depending on the boat type, the battery might remain fixed, and in the case of a smaller boat, your battery would need to be close to your kayak trolling motor mount. Or you can choose one of the all in one solution depending on the size of your battery. Along with this, you need a battery switch where you can quickly isolate the power. This can be crucial in case you happen to get a short because fixed terminals won’t come off without tools. Going further than this, some people spend lots of time on the water and opt to use two batteries for a prolonged period. Rather than disconnecting wires, a battery selector switch only needs to be turned from battery one to battery two. Another option is where the all option is used, and the motor draws power from both batteries. Moving on, a durable construction should be a first because the last thing you want is a battery which springs a leak and you find acid in the bottom of your boat. Most marine batteries are durable, but it is worth checking they will fit on your boat in an upright position, and if they are going to remain on the boat between uses. At this point, you can either remove batteries to charge them or if they are going to be fixed, you can use one of the many onboard chargers. This in itself leads to many other questions, but if the battery gets lots of use, they can save lots of time. The decision here comes down to the battery type, and also the battery ratings, this, however, is the same regardless if you charge on your boat or on dry land in your garage. To make sure you get the most extended life from the best deep cycle battery, you need to make sure it is charged correctly. Deep cycle battery charging all depends on the battery size, the battery type and also the type of marine battery chargers you’re using. Although there are plenty of off the shelf chargers around, these might not be the best battery charger for your battery. 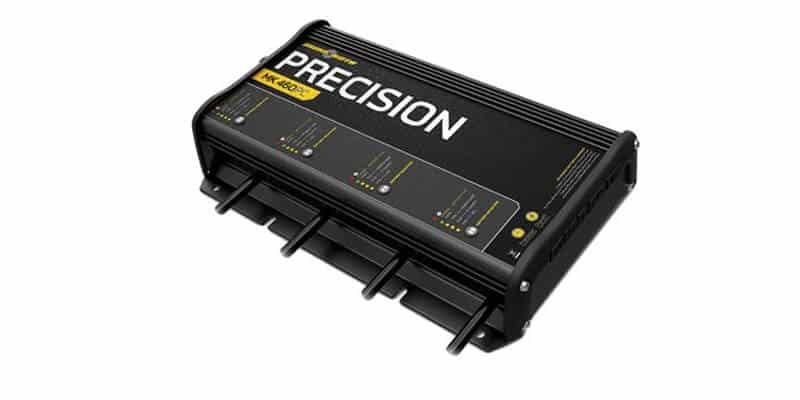 In vehicles, it doesn’t matter as much, but with the deep cycle, you need to make sure your charger meets the needs of your battery exactly or surpasses the minimum requirement. Lithium-Ion batteries charge the fastest, but they are still new and cost much more than the AGM battery types. 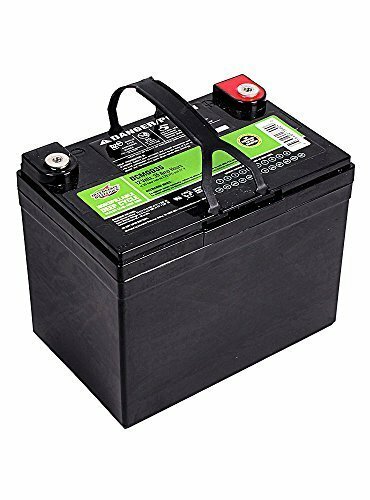 Wet cell batteries also require maintenance, so they are best left out of the scenario. Going back to Amps, these dictate how long it will take to charge your battery. The higher the chargers amps, the faster you can charge your battery. On average, for a regular battery, it will take 12 hours with a 5-amp charger, this can be done overnight, but the crucial part here is to make sure you don’t overcharge. The best battery chargers will have automatic cut-out built in, this not only prevents overcharging but it can also avoid anything else more drastic happening. Another thing to consider is how dead the battery is before you start charging, this has a severe impact on the time. Thus no battery should be used to this point because it is the quickest way to kill your batteries life. Undercharging with your marine battery charger also has an impact because batteries have a sort of memory, they reach a point and won’t charge any further. With all this in mind, it is best to show you one of the best deep cycle marine battery charger options you can get. This Minn Kota battery charger can cost less than a battery, and if it extends your battery by only 6 months, it will have paid for itself, and it should extend battery life much longer than 6-months. Automatic Temperature Compensation – charger sense and adjusts to outside temps to optimize the charge. Come in 1 bank, 2, 3 or 4 bank charging models. With a wide range in batteries which were reviewed, we came to a conclusion there was only one clear winner. 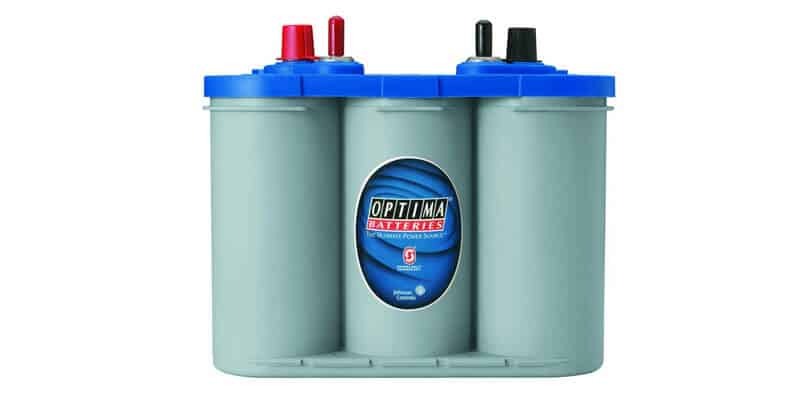 This was the Optima Batteries 8016-103 D34M BlueTop Starting and Deep Cycle Marine Battery. The reasons behind this are clear once you have used this battery, it can be used as a starting battery or as the primary power source on smaller motors. The battery life was more than sufficient, and the claims of shorter than average life would be the same with any battery if you used at the maximum power draw continuously. In testing, it performed admirably and never once hindered the operation of the boat, and could easily be stored out of harm’s way. The Optima Marine battery deserves the accolade. The two-year warranty is higher than the competition, and the 1-year span it can hold a charge with minimal power loss means you can limit the number of charges and you will be sure it won’t die on you in between use. It might appear a little more expensive on paper, but considering the ampere-hours is above average compared to the other batteries of a similar size, and the fact it performs well in colder conditions, it is a power source that won’t let you down when you least expect it.